Since I don't have the individual stone pots like in Korean restaurants, I made the "non-sizzling" version of Bibimbop (Korean-style mixed rice) tonight. It's not just easy and delicious, but it's also fun to make. 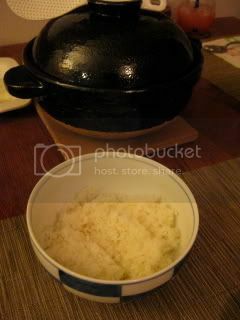 I served a big plate of toppings along with the rice made in donabe (clay pot). Then, each of us made your own version. 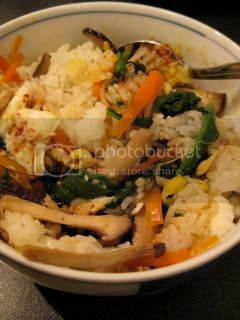 Toppings I made are Bean sprouts, spinach, carrot, mushrooms, and chicken. 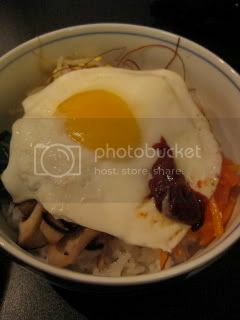 I posted the recipe (vegetarian version) on toiro's website. You get your donabe rice in the bowl, put the toppings (including very runny-yolk fride egg and kochujan paste), then mix everything together! It's so healthy and yummy...everyone should try this, really.